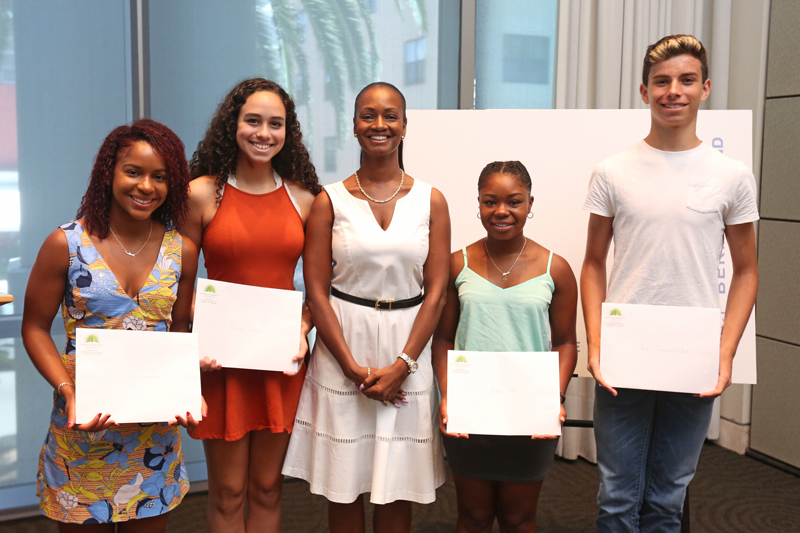 The National Dance Foundation of Bermuda has awarded scholarships and bursaries to the island’s talented young dancers, with Rhianna Evelyn, MeShalae Hayward-Furquan, Ravi Cannonier-Watson, Taylor Railton, Alexis Smith and Jada Pearman all receiving educational awards thanks to generous corporate sponsors. A spokesperson said, “The National Dance Foundation of Bermuda is delighted to announce the awarding of six scholarships and bursaries to some of Bermuda’s most talented young dancers, thanks to the generosity of both individual and corporate donors. “This dance scholarship legacy was established by the Bermuda Ballet Association in 1962. In 2005 the National Dance Foundation assumed the responsibility for continuing these awards. At the presentation at the XL Catlin O’Hara House, Senator Crystal Caesar, a long time member of the Dance Foundation Scholarship Committee said, “The first of two bursaries totaling an amount of $5,000 have been generously contributed by the Chubb Charitable Foundation. “The first is awarded to Rhianna Evelyn who is studying dance at Grier School in Pennsylvania. This summer she has been at the Burklyn Ballet Theatre in Vermont and also Joffrey Academy in Chicago. Presenting the bursaries on behalf of the Chubb Charitable Foundation was Ms. Lori Dunstan, VP Global Corporate Giving. The NDF said, “In the second bursary category, The Chairmen’s Scholarship, donated by Don Kramer and Brian O’Hara valued at $5,000, was awarded to Ravi Cannonier-Watson who is continuing his training at the Royal Ballet School in London. “Ravi received excellent grades this year and has recently performed at the Royal Opera House in Covent Garden, London. Mr. Brian O’Hara presented this award. “Two awards were generously sponsored by the Argo Foundation with a total value of $15,000. The first Argo Scholarship of $7,500 in honour of Madame Ana Roje has been given to the young talent Ravi Cannonier-Watson . “The second Argo Foundation award for $7,500 goes to assist MeShalae Hayward–Furquan to continue her studies in pursuit of a BFA degree. Mrs. Elspeth Gray President of the Argo Foundation presented these awards. “The BF&M Scholarship of $7,500 in honour of Mr. L. John Profit has been awarded to 20-year-old Taylor Railton entering her final year at SUNY Purchase [State University of New York] where she has performed in many classic and contemporary works. “This past year she chose to study in London at the London Contemporary Dance school where she was asked to teach ballet so that British dancers could have some insight into American training styles. A long time friend of Mr. Profit’s, Ms. Gina Bradshaw, Senior Relationship Manager for Client Services of BF&M presented this award. “The Arch Scholarship of $7,500 in honour of Georgine Mary Russell Hill, a much loved member of the National Dance Foundation, has been awarded to Alexis Smith studying at the University of the Arts in Philadelphia and also dancing with the Philadanco company, a professional dance company in Philadelphia. “Alexis has spent several summers teaching dance at summer camps in Bermuda which is heartening to see her giving back to the community just as did the humanitarian Mrs. Hill. Presenting the Arch Scholarship was Ms. Patrice Hill of Arch Charity Committee. “The most prestigious Catherine Zeta Jones Award valued at $15,000, is in memory of Patricia Calnan. Patricia was a founding member of the Bermuda Ballet Association, a revered and passionate dance critic. “This was awarded to 21-year-old Jada Pearman, not only a top scholastic student but also a gifted dancer and performer in her final year while studying for a BFA at the University of  Arizona. “Mr. Brian O’Hara, co-chair of the National Dance Foundation of Bermuda Fund presented this award on behalf of Catherine Zeta Jones as well as Patricia Calnan’s son, Detective Chief Inspector Nicholas Pedro. Thank you to all the corporate and private donors who make this possible. What a wonderful contribution to the Bermudian talent pool of individuals dedicated to dance. Bermudian’s have a long history of dance and it is wonderful to see it continue through these talented youth. We can be confident that these gifted athletes will contribute to the well being of Bermuda and our world.